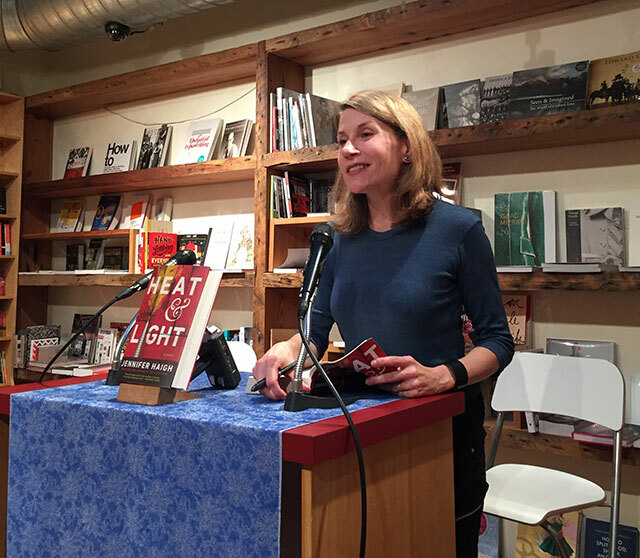 Jennifer Haigh presented her latest novel Heat & Light at BookCourt in Brooklyn. The novel follows a family and other characters from Bakerton, Pennsylvania as they grapple with the shale gas bonanza. Bakerton is also the setting of a previous book Baker Towers, a novel that takes place in the middle of the last century as the town dealt with the decline of the local coal industry. Bakerton is modeled on Haigh’s own hometown, a place she is intimately familiar with and a place she is constantly returning too. For Baker Towers, she says writing about the town was like writing about something frozen in amber. It was the town’s golden age. Heat & Light though is set in the present. “The fracking story is still a breaking story,” she explains. Writing about class issues seemed inevitable. She describes herself as coming from a working class background and says many of her writer friends are not. Its an uncool subject to write about a dying coal town, she says, but your background is yours to use. Haigh describes her parents as having a working class attitude toward education and particularly about college. The persistent question was always about what that education would do for a job. Selling working class narratives to editors can also be a tough task. Editors respond to stories they recognize, and often they are not themselves from working class backgrounds meaning its difficult for them to relate. Online, the book is tagged as a political novel. Haigh says she didn’t really see herself as writing political novels. She does however, find that subjects with deep disagreement to be interesting to her. Fracking is one of those issues. As she wrote the various characters, she found her opinions shifting with their voices. Both sides have a total incomprehension of the other side, she says. People in Boston where Haigh lives now cannot understand how anyone would allow fracking to happen on their land. In Pennsylvania, people who are poor and out of work cannot understand how anyone would turn down found money. It is a fundamentally class-based argument, she says. “I would never sell my mineral rights,” she said, but adds that a lot of the people do so without the assistance of a lawyer and often they aren’t well educated. Those two factors put them at a major disadvantage in comparison to an energy company. Since she was writing about a town very similar to the one she grew up in, she was nervous when her first novel came out because she didn’t know how the people in the town would react. Mostly, she says, they were happy to know someone thought enough about their town to write about it. Haigh first began writing Heat & Light and one challenge about writing about the present is conditions change. At one point it seemed Pennsylvania might outlaw fracking. It didn’t, but Haigh was nervous. Now fracking has slowed as the price of oil has fallen, but it can and likely will return. The first two years of writing the book was spent trying to figure out what the novel was about. Haigh says she kept changing the personalities. The book is about a lot of things and writing it is about how they all work together. She wrote the book as small pieces and then put them together afterward. “This is how not to write a novel,” she says. Normally she simply writes from the beginning and moves forward through time until the end. For her research, Haigh spends a lot of time talking to people and interviewing them. She tries to ask open ended questions and then listens to the answers.